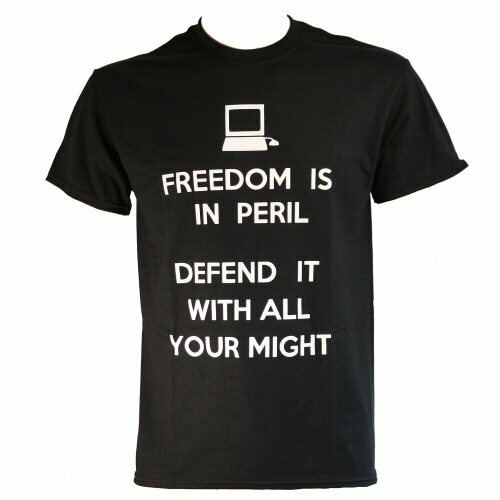 Black Defend Freedom T-shirt with high quality white screen print. The caption, 'Freedom is in peril. Defend it with all your might', is a poster designed in 1939 as part of the series of Home Publicity posters which included 'Keep Calm and Carry On'. You decide what the computer on the top means to you! Printed in the UK. The t-shirt is made in 185 gram 100% pre-shrunk cotton and has a seamless reinforced crew neck, and taped shoulders. Twin needle stitched. The t-shirt follows the traditional US army cut with non-cuffed sleeves. Length is optimsed for heights around 5'10. The chest sizes are as follows: S (35in), M (38in), L (41in), XL (44in).